The Wider 150’ project was first announced to the public by President and Founder of Wider, Mr Tilli Antonelli in September 2011. 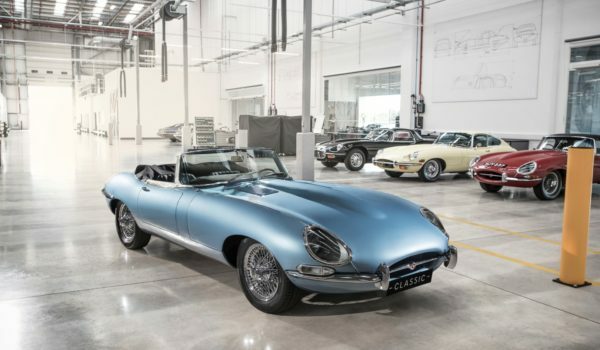 At a press conference at the Hermitage in Monaco a crowded room of journalists and industry professionals witnessed the unveiling of a project that was as noteworthy for its innovative technology as for its sleek and modern styling by Fulvio De Simoni. The Wider 150’ has a propulsion system that draws inspiration from thousands of military and commercial vessels that run using diesel electric power. This technology is over one hundred years old, and has been refined over the last century to provide the most reliable and economic solution to many applications in the marine industry today. 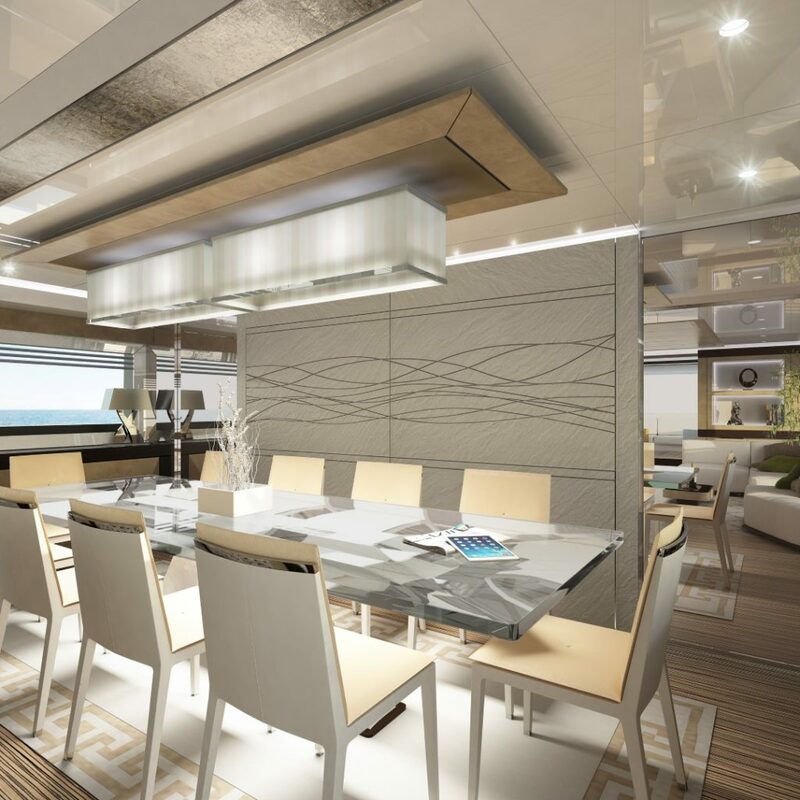 The Wider Engineering team have sourced experienced and proven suppliers to adapt diesel electric technology to a super yacht setting, where not only reliability and economy are called for, but also supreme comfort and convenience. Wider say that they have eliminated this problem. Energy from the generators is carried by cable, not shafts, so there is no need for a large engine room mid ships. The results are impressive; not only is there more room for the guest cabins in the best part of the hull, but the yacht can also hold a 32 foot tender that launches from the transom to leave space for a spa and indoor pool. Lithium Polymer batteries are at the heart of the system, these store the energy produced by the generators and release it according to the requirements of the owner. If the owner wishes to run at zero emission mode using just the batteries, or if he would like a night at anchor without running the generators, he can do so. 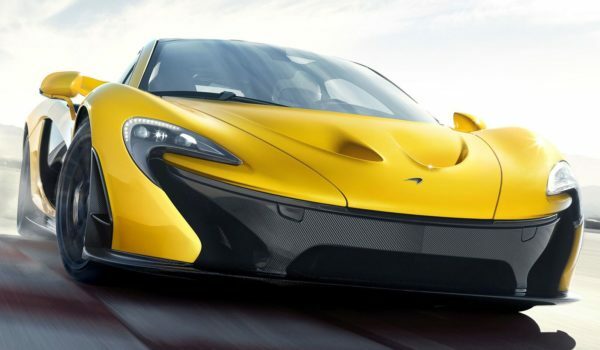 If he needs higher performance then he can run the yacht from the variable speed generator engines, but any excess power is diverted to recharge the battery banks so there is no wastage whatsoever. The benefits of this system are truly noteworthy. Conventional yachts run generators at a fixed speed, burning fuel at a fixed rate whether that be too little or too much for the load at the time. By connecting MAN engines to VISEDO alternators Wider offer variable speed generators that will only be run at the speed that is necessary at the time. 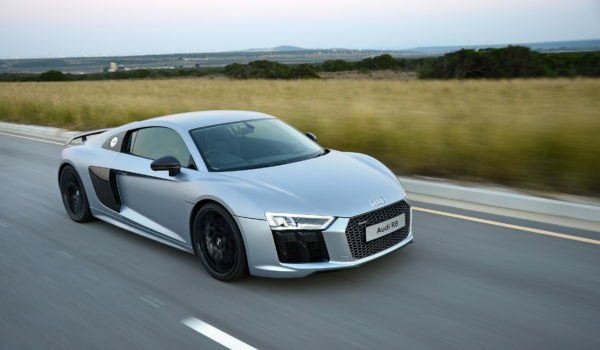 The result of this is greater time between overhaul of the engines, greater fuel economy, and greater comfort since noise and vibration are kept to an absolute minimum. 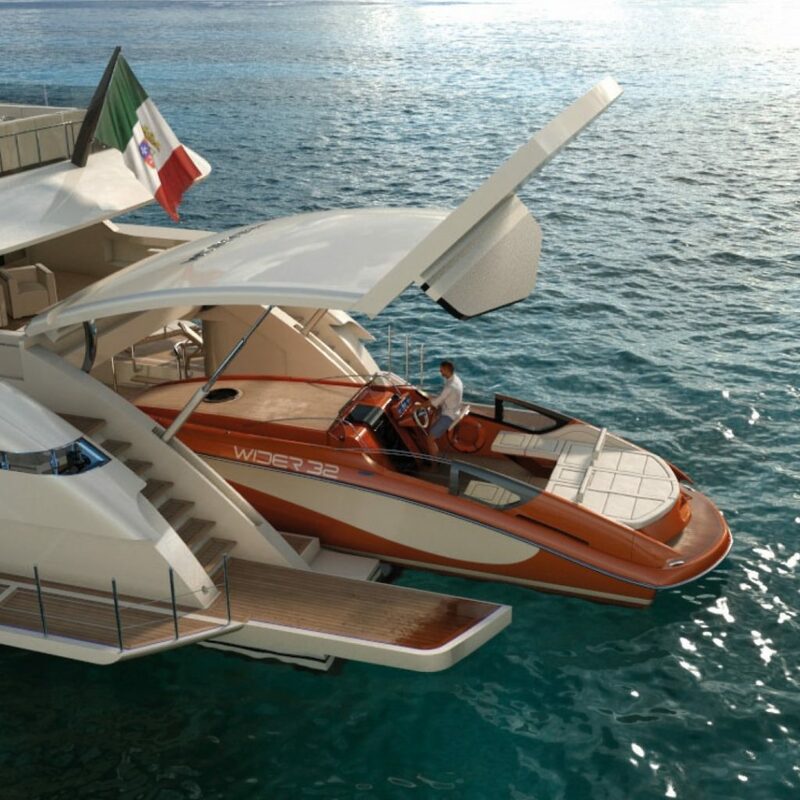 The Wider 150’ under construction in Ancona is a sophisticated evolution of the prototype revealed in Monaco in 2011. 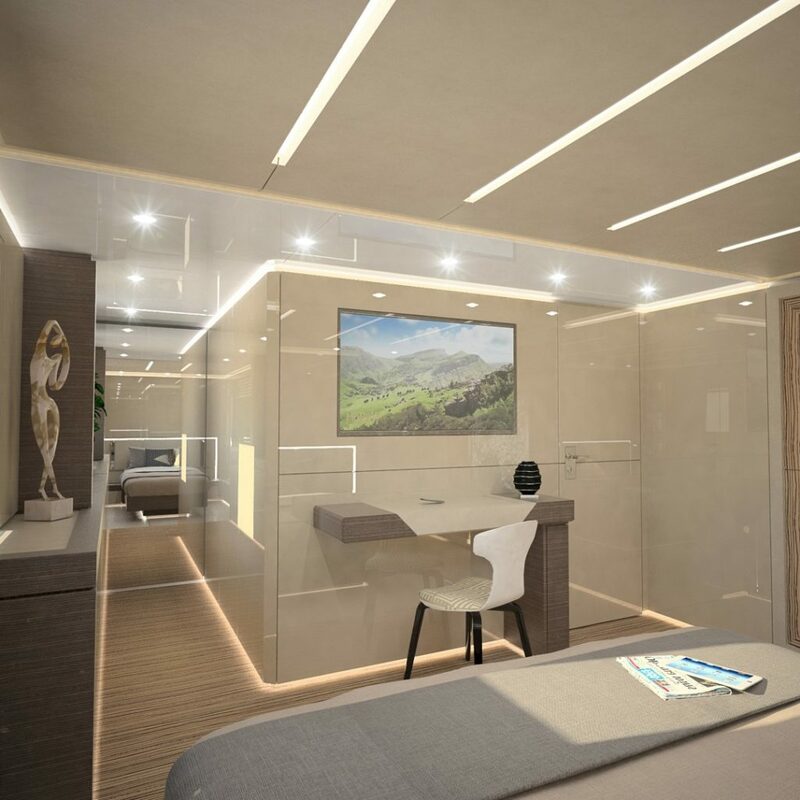 The designers have focussed great attention on the need to bring natural light into the vessel, allowing owners and guests to enjoy the spectacular scenery that usually surrounds super yachts and guaranteeing easy access to the sea. 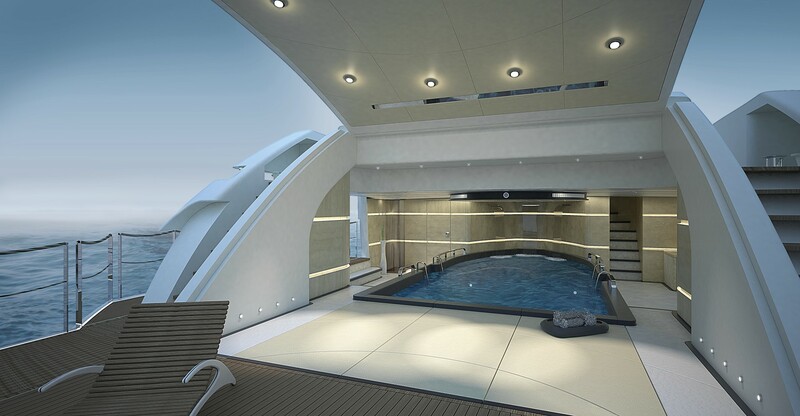 To accomplish this, the beam of the yacht has been increased to 8.53m, windows have been enlarged, bulkheads moved to give better access to the upper side decks, and side bulwarks lowered to give greater visibility from the inside looking out. 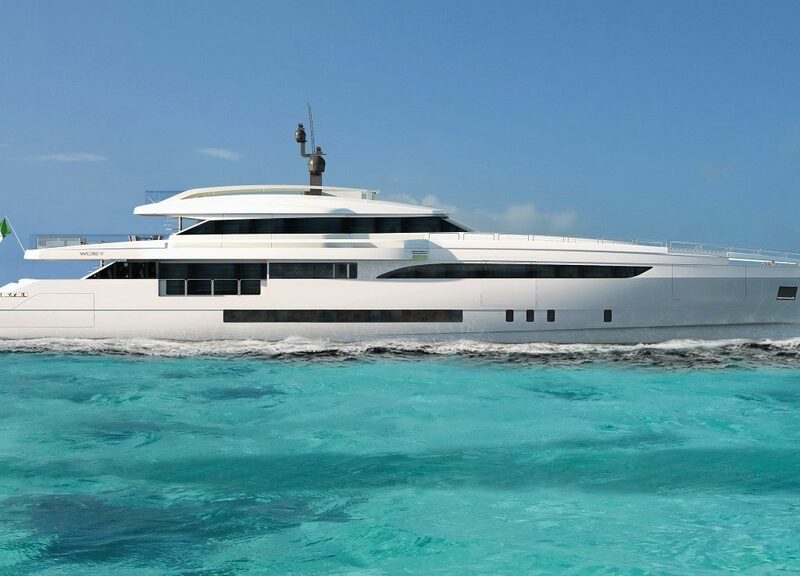 The Wider 150’ retains all of the sleek Italian styling of the prototype but has enhanced its assets to a maximum and retained the hallmark “Wider beach”. The shipyard’s Engineering Department have spent countless hours researching the most reliable and efficient mechanisms for the beach area, a feature of the vessel that has drawn the attention of well over two hundred thousand viewers on Youtube, where a video demonstrates the process. In a computer rendered graphic video, a generous section of the transom sides and stern are seen to fold down from the hull to form a sea level deck area that is a perfect base for sunbathing and water sports activities. 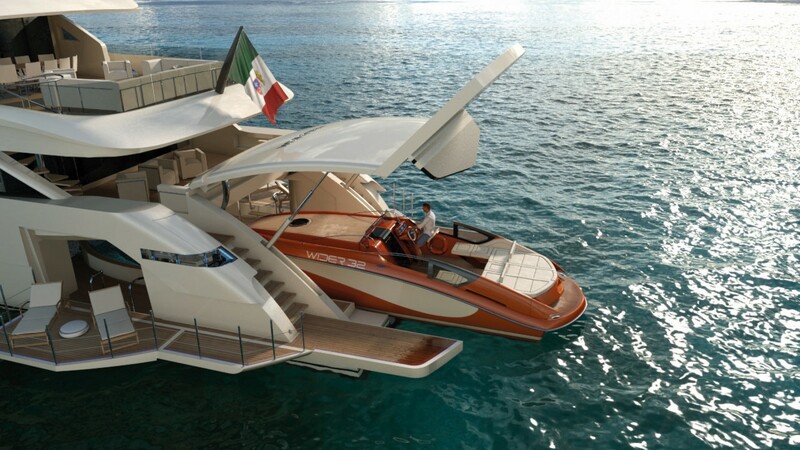 The Wider 32’ tender launches from inside the yacht, leaving an indoor swimming pool and spa area. The upper deck encompasses a sky lounge and casual dining area adjacent to large windows that are designed to ‘disappear’, allowing access to the side terraces. This Wider design allows a continuous dialogue between indoors and outdoors. The captain’s cabin is located aft of the bridge, enabling him or her to have complete control of the ship at all times. 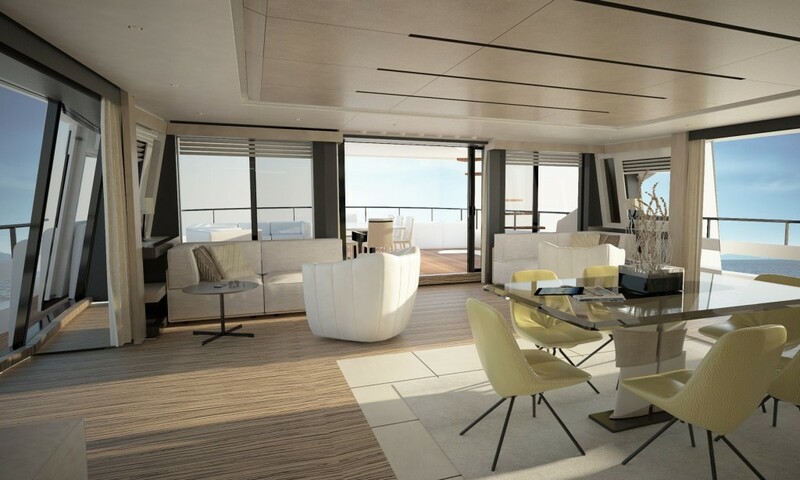 The main deck features a well-equipped exterior cockpit and a large interior salon that is split into two living areas. 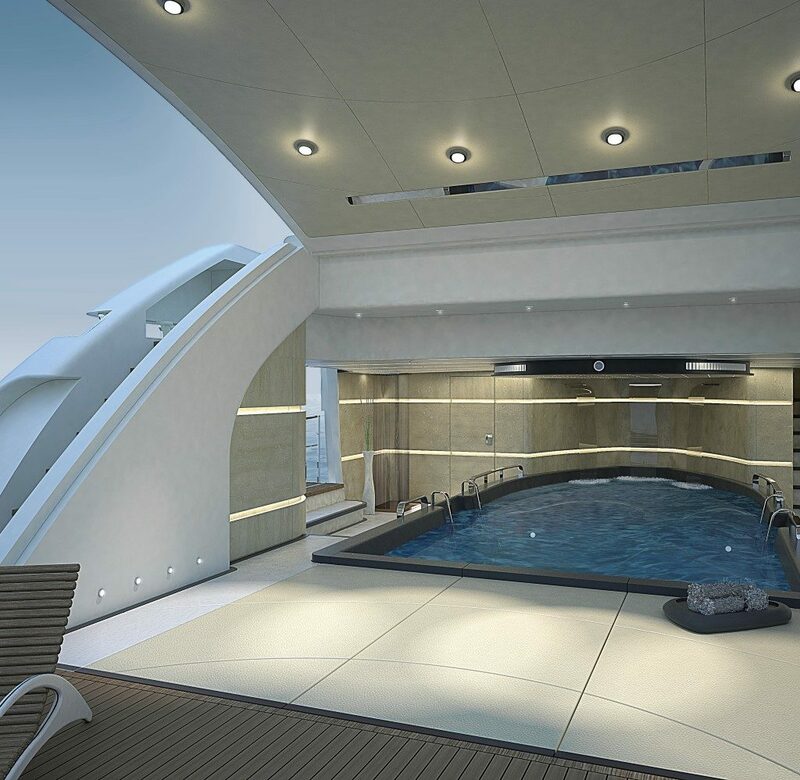 Forward lies the master suite, which stretches out across the entire beam of the yacht. Large windows draw huge amounts of light into this area and offer unparalleled panoramic views. 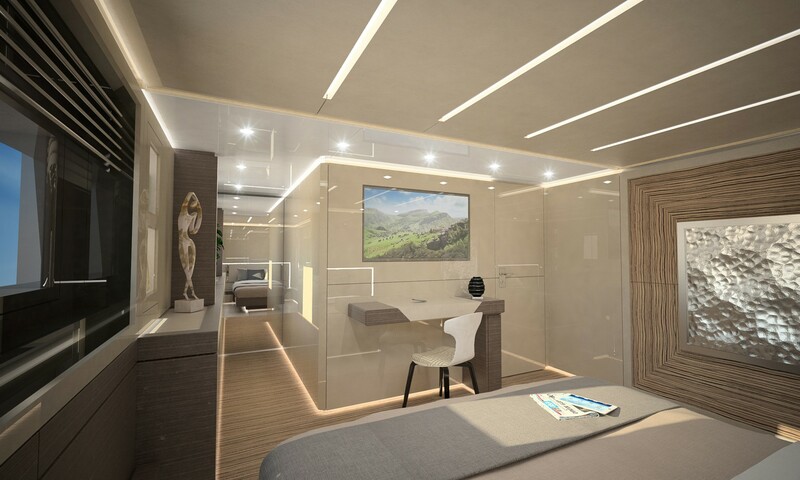 Moreover, the master stateroom can be divided into two separate areas by closing a sliding partition. Just aft is an en suite salon/office where the hull side opens outwards to create a private terrace overlooking the sea. The foredeck design provides enclosed housing for the crew tender and the water toys. 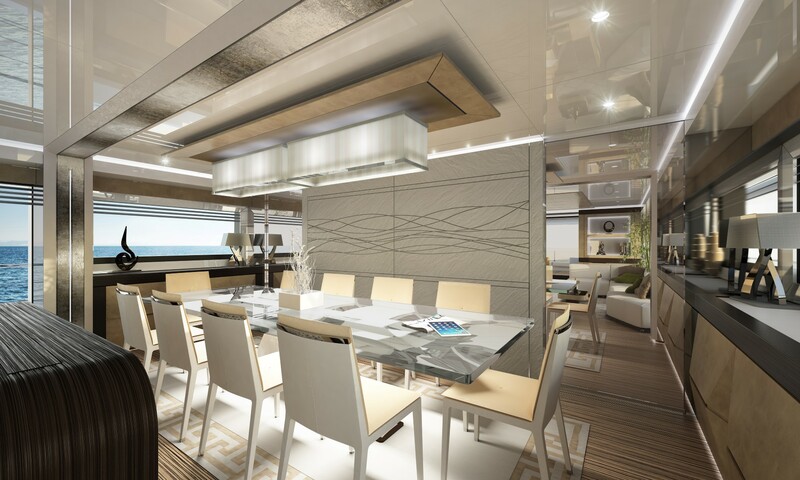 This part of the superyacht also is engineered for extreme versatility, as it features a large, comfortable patio that appears in just a few seconds when the upper section of the deckhouse is elevated. Delivery schedules are being drawn up aiming to launch the superyacht in the summer of 2015.